Welcome to this website! This started out as a temporary location for my tutorials and projects, which has become quite popular, and as a result, fairly permanent. As long as Wikidot keeps cooperating with me, I'm planning on staying here. This site is designed as a place to help you get going with game development (or just software development in general) and provides you with tons of free amazing tutorials, software, and resources for you to use. 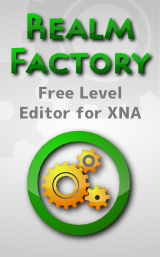 Take a look at my XNA Tutorials as well as my MonoGame Tutorials, and my Realm Factory program, which is a basic (free) level editor for XNA. Or see what other people are saying in the Forum. Lots of updates the last little bit… Hope you guys aren't getting tired of them. I just opened up a category in the forum for art-related stuff, and made a post about forming a group to do some 3D modeling stuff in there: http://rbwhitaker.wikidot.com/forum/c-2112222/3d-modeling. If you're interested in getting some practice doing 3D modeling, this might be helpful to you. I've also begun doing work to update the MonoGame tutorials to VS 2017 and MonoGame 3.6. This will take some time, but I'm currently done with the updates on the introductory tutorials and I'm working on the 2D tutorials now. 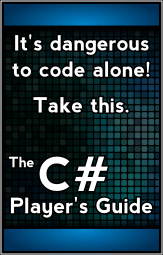 I'm sure I'll be back to more C# Player's Guide, 3rd Edition stuff tomorrow! It seems the printer didn't get my copy shipped off until I asked them about it again for some reason. They've always been very good. Probably just an honest mistake. At any rate, the book is coming Monday, so I expect that the 3rd edition will finally be available Monday evening! Digital version is now available by request. Just send me an email (moc.kooltuo|rekatihwbr#moc.kooltuo|rekatihwbr) and I'll get you the link. People have asked about the cost. The physical book is selling for $29.95, and because of some constraints from Amazon about not allowing me to sell it for less elsewhere, I'm making the digital book the same price. Few people actually seem to prefer the digital version. It seems mostly (but not completely) limited to the people who are in a place where shipping is prohibitively expensive. This price point is a few dollars higher than the 2nd Edition, but you're actually getting a ton more content too. If the amount of work I did between 1st and 2nd editions counted as one update, then this new version should really be about the 8th or 10th edition, not the 3rd. Lots of new chapters, lots of new information in existing chapters, lots more cleanup and revising, more problems to work on, etc. I would definitely not recommend anybody get the 2nd edition once the 3rd is available. I'm getting a lot of questions now about when my book is coming out. I've got everything just about ready, but I had to see the final version in physical form before being OK publishing it. The printer OK'd the final files this morning, and I had them send me a copy. Once I can see and hold that version and know that everything is OK (Friday evening) then the 3rd Edition of the C# Player's Guide will be available for purchase! In the meantime, I've got a few little website tweaks to still make. The digital version might be available by request as early as tonight (need to make one final tweak) so if you are thinking about buying the digital version, just send me an email (moc.kooltuo|rekatihwbr#moc.kooltuo|rekatihwbr or moc.ansis|38rekatihwbr#moc.ansis|38rekatihwbr) and I can get that going for you. For the time being, the digital version will require an actual email request to me, since the 2nd edition ended up getting pirated (my worst fear about a digital version came to life). Competition #10 gets underway today! Good luck to everybody who has signed up. And if you didn't sign up, it's not too late! Feel free to jump in and start making progress on your own game. If you're looking to make or join a team, feel free to post something in the forum under the Competition #10 category. I'm sure somebody will be interested in letting you join or joining you. As for me, I'm not starting on my game for the competition just yet. I need to finish updating my book to the 3rd Edition. It's very close! But probably another week or two before it's done. So that will be what I'm working on for the first part of the competition. It's about time for an update on things! We've now had our schedule planning meeting and made the decision to have 4 competitions and 2 collaborations every year. You can check out the events page to see the chart and updated calendar. Of particular note: the next competition starts on February 3rd, which is only a few weeks away now. We also have now held our competition retrospective. The competitions are going to change slightly going forward. The focus will no longer be about "completing a game in 30 days", but rather focusing on helping people integrate game development into their busy lives and making serious and significant process on their game development projects. The collab retrospective is this week, culminating with a chat room text-based meeting on Saturday (7:00 pm UTC-0 time, which is 2 pm EST and 12 noon MST). Check out the events page for all of the details on that, or drop in the chat room to share your ideas! I've also scheduled our competition and collaboration schedule planning for this coming Saturday at 12:00 noon Mountain Standard Time, which is 2 pm Eastern and 11 am Pacific. It is also 7 pm UTC-0 time. Collab #6 is coming up next weekend, and talk about the next competition (#9) is also heating up. Please take a look at the links on the top of every page to check those out! I swear I'm around here! I don't know why I don't post updates here very often though. I just updated the MonoGame reference to say that MG 3.5.1 is the latest, rather than 3.4.0. That same tutorial also mentioned that you should install VS 2013 Community Edition, which has now been superseded by VS 2015 Community Edition, so I fixed that too. Also, the MonoGame tutorial about loading sprite fonts was horribly out of date. It still assumed that you had to use XNA's content pipeline, which is simply not true anymore, and hasn't been for at least a year. So I got that updated a week ago, based on somebody popping into the chat room and bringing it to my attention. Competition #8 is starting to reach the finish line! Just a few more weeks left, but that's actually still enough time to jump in if you are just hearing about this now. I got a new phone the other day, and hadn't gotten it to get my email until today. I'm not in the habit of going to the website and checking it, so I have not done a very good job of responding to emails for the last little bit, and I apologize. I'll try to catch up on them, but there's enough there that it might take a while. Anyway… we also just completed Collab #5. We decided to extend Xevious, which we started in a collab a year ago. I'd say it went quite well. I'm happy with all of the things we were able to do as a group. I think there's a video of what we did around here somewhere. The other big news is that Competition #8 is coming up pretty quickly now. I think our tentative start date is May 28th, a month out. There's been a lot of talk about making this one a 100 day competition, too, though I think we are also planning on making it easy for people to jump in and out as needed, knowing that 100 days is more than enough time to get distracted with this thing that some people call Real Life. Just a heads up: MonoGame 3.5 came out yesterday. I haven't had a chance to update the MonoGame tutorials yet, but it would appear that for the most part, other than the name and possibly the link, nothing pertinent to these tutorials have actually changed. It looks like most of the changes are either related to Mac and Linux, making it work more like Windows does, or bug fixes. I don't see any especially important new features that will affect all MonoGame users, especially not beginners who are using these tutorials. As a side note, they've moved to quarterly releases, so I think we can expect to see a more regular cadence of releases from MonoGame in the future, which I'm rather excited about! Well after a long wait, the 2nd edition of the C# Player's guide is now available on Amazon! I didn't plan it, but it turns out, the date they got for the official publish date happened to be exactly 3 years to-the-day from when the 1st edition was published. I guess that might mean the 3rd edition will come out 22 September 2018? Hopefully in the mean time, there's some other books. Thanks again for all of the support I've gotten from you guys for my book and my website over the years. This book couldn't have been possible without the feedback and conversations I've had with you in email, the forum, and the chat room over the years! Here's to many more years of that same stuff to keep things moving forward! The physical book format is due soon. I'm in the process of sorting out a few final printing problems with the printer. It should be only a few more days before it's ready. Thank you all for your support of the 1st edition! We've begun talking about the scheduling of Collab #3 and Competition #6, both due in something like 2 to 6 weeks. If you're interested, go over there and check it out and weigh in on what dates work best for you. You should expect a bit more work to refine some of the C# tutorials over the next little while as well. Especially some of the later ones like delegates and events. They need a bit of attention. It's been a long time coming, but I've finally updated my introductory MonoGame tutorials to use MonoGame 3.4 instead of 3.2. This fixes all of the content management problems that MonoGame has had in the past, and the new tutorials and the new version of MonoGame should be much, much smoother. Not sure how all of this time always seems to pass between official updates. If you've been in the chat room or anywhere else on this site, you know I've been around. Anyway, the purpose of my showing up here today is to let everybody know that Game Dev Competition #5 is fast approaching! We're scheduled to run from the 22nd of May through the 21st of June. We're currently in the process of discussing theme ideas, so if you have any suggestions, feel free to throw your ideas into the mix. We'll soon post an official signup thread and the official rules, though I'm sure it will be quite a bit like all of the other competitions we've done just with a different theme. In short, it's more of a friendly challenge than a competition. You've got 30 days to make a complete game, preferably from scratch (no coding in advance) with the aim of producing a sellable game (or not) of your own creation, using whatever tools or engine you want. Everybody's invited to join, regardless of how much experience you have in game or software development!